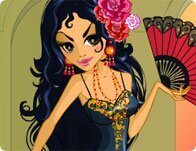 Description: With ruffled attire and raven hair this flamenco dancer carelessly captivates and entertains. Style her in traditional flamenco skirts and gowns! Instructions: Use your mouse to click on and through the floating clothing, hair, accessory, and background options and style this lady.